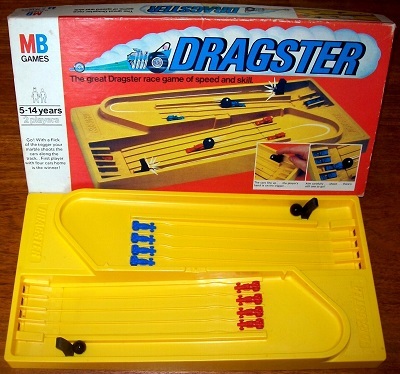 'DRAGSTER' GAME: The great dragster race game of speed and skill. Go! with a flick of the trigger your marble shoots the cars along the track. The first player with four cars home is the winner! The game is complete and in excellent condition. The game box is perfectly sound and both the track and playing pieces are in flawless condition.